I got to see my friend Nathan Galster when I was in Mississippi. I interviewed him for the project but I don't think I did very good asking questions and taking notes. Having a lot of doubts about that aspect of the book but really enjoyed seeing a friend after a long time. He's very kind and has lots of good stories. 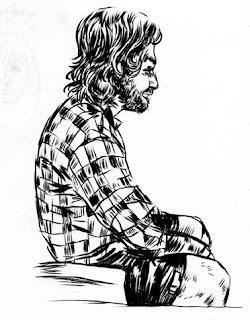 I drew some pictures when he was talking to my mom's friend (who turned out to be a former Marine from the same company, he got out in 2004, the year Nathan went in) but in the life drawings he looked kinda Neanderthal-y. This brush pen drawing is from a photograph and is more delicate. I have a lot of piles of started things but don't know what direction to go in. One foot in front of the other one.